CNG: eAuction 442. Lot of two (2) coins. 442, Lot: 2. Estimate $100. Sold for $66. This amount does not include the buyer’s fee. Lot of two (2) coins. 2a Valerian I. AD 253-260. Antoninianus (21mm, 3.78 g, 6h). Rome mint. 1st issue, AD 253-254. IMP C P LIC VALERIANVS AVG, radiate and draped bust right / P M TR P II COS II P P, Jupiter standing left, holding thunderbolt and sceptre. MIR 36, 4d; RIC V (joint reign) 141; Cunetio 445. Near VF, porosity. Bought from Baldwin's, 1991. Ex Dorchester, Dorset, Hoard (1936) [IRBCH 470]. 2b Gallienus. AD 253-268. 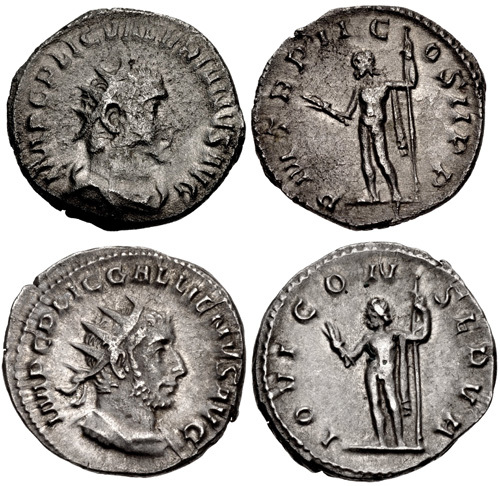 Antoninianus (21.5mm, 3.57 g, 7h). Rome mint. 1st issue, AD 253-254. IMP C P LIC GALLIENVS AVG, radiate and cuirassed bust right / IOVI CONSERVA, Jupiter standing left, holding thunderbolt and sceptre. MIR 36, 25v; RIC V (joint reign) 143; Cunetio 545. Good VF, lightly toned, minor green deposits.